On 17-18 October 2015, six teams from the United States and Canada met to compete at the 11th North-American Underwater Rugby (UWR) tournament that was organized by the club Liberation at the Wayne Gretzky Sport Centre in Brantford, Ontario. For the fourth time in a row, the New Jersey Hammerheads from Newark successfully defended their title and won the tournament undefeated. A mixed team from Camo (Montreal) and the Quincy Narwhals (Boston) finished second after a strong tournament performance and the team from Toronto—often referred to as the Racoons—obtained the third place. The Montreal-Boston team showed the strongest offense, scoring the highest number of goals, while sharing the title of best team with the best defense with the New Jersey Hammerheads. The highest scoring player of the tournament was Daniel Naujoks (NJ Hammerheads), followed by Mateo Galeano, second place and Camilo Contreras and Gord Lemon, shared the third place for top scorer. This was the first North-American tournament after the UWR World Championships in July this year. The training efforts of many players on the US and Canadian side showed throughout the competition with increasingly matured playing schemes and strong physical performances by more experience as well as newer players. The tournament started with a game between the defending champion, the New Jersey Hammerheads, and the East Haven Makos. Both teams were missing key players and had given a chance for younger and newer players to play alongside more experienced players. While the Hammerheads started with a team of six players, they quickly took control of the game. The final score of 11:3 in favor of the Hammerheads included the fastest goal of the tournament. After having received a goal, the Hammerheads player carrying the ball started at full speed and swam through the descending defense and scored a split second before the Makos’ goalkeeper was able to get into position. The second game saw an encounter between the team Liberation from Brantford and the mixed team from Camo (Montreal) and the Quincy Narwhals (Boston). Liberation had given the chance to a few Underwater Football players from Winnipeg to play with them—more on their sport below. Both teams fought hard but the Montreal- Boston team was able to win with quick counter attacks and well coordinated team play 13:1. In game 3, the Raccoons team from Toronto was able to secure a 12:1 win over the East Haven Makos. In the following match, team Liberation from Brantford and a team of players from Newark crossed fins. The Newark team had formed just a few days before the competition from New Jersey Hammerheads players to give players more time in the water during the tournament. The Newark team was able to finish with a clear 12:2 win over Liberation. The last game in group A was held between the NJ Hammerheads and Toronto. Both teams played high-level rugby, rotated the ball, and came in strong on the opponents’ goal. However, especially in the second half, the Hammerheads were able to play very organized and finished the match beating Toronto 6:3, leading to the first place in group A. The last game in group B was fought between Montreal-Boston and Newark. Montreal-Boston coordinated their attacks well, played on all levels of the pool, passing quickly from the surface to mid-water to the bottom. Newark played well but was overcome with a final score 10:3 in favor of Montreal-Boston, who finished as the leading team in group B. 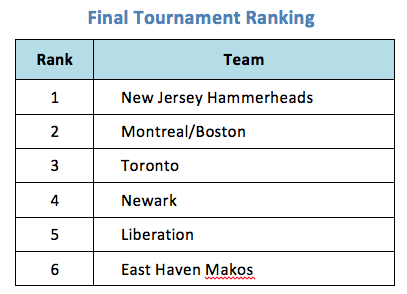 In the afternoon, the three final matches of the tournament started with the game for the 5th place between the East Haven Makos and Liberation. The Makos pushed hard put Liberation was able to control more of the game and win the match and thus the 5th place with a final score of 8:3. The teams from Newark and Toronto met in the game for the 3rd place. In a heated game during which both teams gave everything Toronto—who played with a full team, as opposed to a reduced Newark team—had more possession and won with a 6:3, leading to a deserved third place in this competition. In the final, the New Jersey Hammerheads played the Montreal-Boston team. The two strongest teams of the tournament were each eager to finish the competition as the winner. Each side came in strong, changed quickly from defense to the offense game and vice versa. At halftime, Montreal-Boston led 2:1. In the overall clean game, a player from the Hammerheads was sent out for two minutes for repeated holding without a ball. One man down, the Hammerheads pulled together and were able to use a quick counter-attack in which the attacker faced the goalkeeper alone to equalize. In the end of the game, the Hammerheads recovered the ball at their goal, moved the ball with sprints from two players to the opposing goal. One attacker was able to pass the ball under the defender to his counterpart who was lying on the other side of the goal and who scored only 15 seconds before the final whistle. The final score was thus 3:2 and the New Jersey Hammerheads had won their fourth North-American Underwater Rugby tournament in a row. Thanks to underwater football players who had come from far-away Winnigpeg to get acquainted with UWR, on 18 October 2015, rugby players were introduced to this ‘sister discipline’. Underwater football is played in a few cities in Canada only but it has been around since the late 1960s. Players’ equipment is similar to rugby, involving caps, fins, masks and snorkels. However, instead of scoring in a basket on the bottom of the pool, the scoring zone is at the side of the pool, outside the water. While the tactics and game showed some differences—for example, football players are not allowed to bring the ball the surface—the UW football players present in Brantford hoped that a team could be playing at a future UWR tournament.